I really do try to plan my blog posts and come up with something to entertain you all. Lately I feel like I’ve been slacking in that department but I’m hoping you haven’t noticed. Perhaps bringing it up isn’t the best idea, eh? 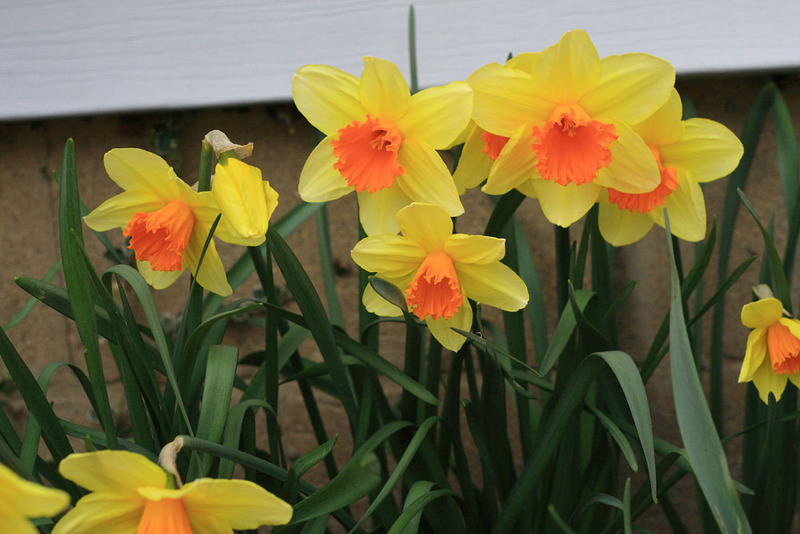 Lovely yellow and orange daffodils. A crab apple tree loaded with buds. 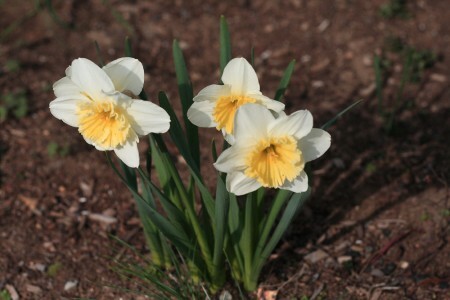 More daffodils, these of the white and yellow variety. Squill in bloom. I just love photographing squill. And that’s my yard these days. What’s going on in your backyard? Beautiful! Our plant life is slightly ahead of yours, but the recent weather has caused carnage and slowing of the blooms. Enjoy it while you can! Those little blue flowers are called “squill”? My yard is loaded with them, but I never knew what they were called. I hadn’t seen them before we moved to Massachusetts. Well – at this very moment there is a pretty golden retriever out there doing her “morning business” but I don’t guess that’s the kind of thing you were looking for?! So. Jealous. Of. The. Green. We have daffodils and myrtle in bloom. My tulips have opened but my forsythia is behind yours. The squill is beautiful. I never knew the name of them but I shall use it from now on. So pretty. Not much going on in my back yard last time I checked, but today might be a good day to check again. Squill, eh? Thanks for the new word, along with the cheerful Spring pictures. Lovely photos, and a botany lesson. I never knew what those little periwinkle colored flowers were called! Alas, we are getting plenty of budding and, likely, 8″-12″ of snow over the next day or two. Roses and weeds. That’s my backyard. Pretty flowers! I need to be more diverse in my daffodils, I think. Your yard looks glorious Carole! You have a lot blooming! Our dogwood trees and azaleas are blooming, the daffodils and tulips are done, my lilac has buds on it, and the lily of the valley and peonies are up. Your plants and flowers are beautiful…Don’t have much popping up here yet…darn it! Count me as another reader who didn’t know the blue flowers were called squill. Thanks for teaching me something new so early in the day! Love the squill! I was just thinking that I need to add some early purple or blue bulbs to the garden. 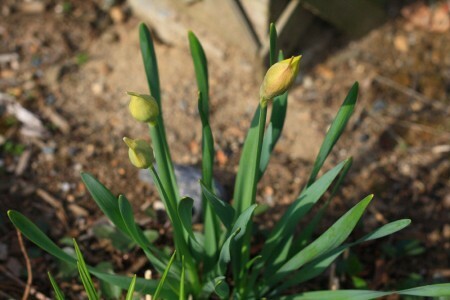 I have lots of purple later in the year, but not anything that blooms with the early bulbs. We have lots of squill and those other blue things. 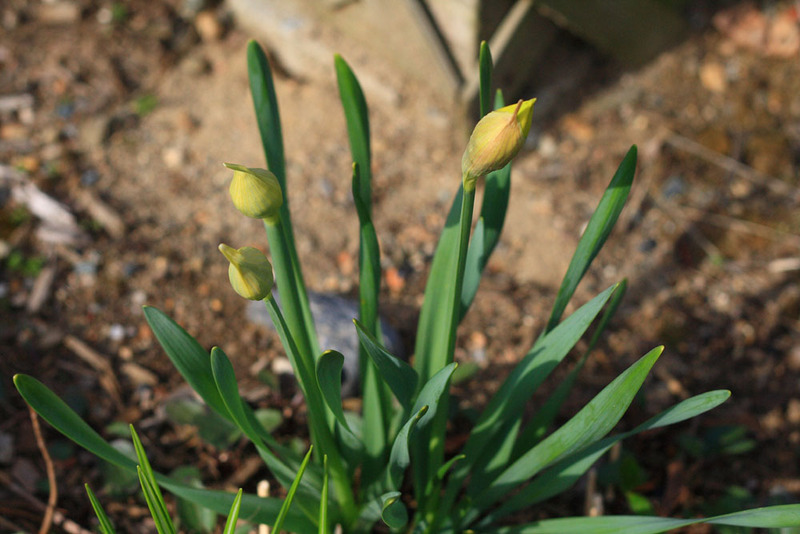 Our daffodils have dwindled to practically nothing; I really need to plant some more. And the red maples are in bloom! I do that yarn/yard typo all the time. Most of my flowers have faded, since it got hot. Cool today, though – if the wind doesn’t kick up, should be lovely! Wow, your yard is way ahead of mine! I haven’t seen anything even remotely looking like a flower or bud yet. Violets among the green. I LOVE violets! 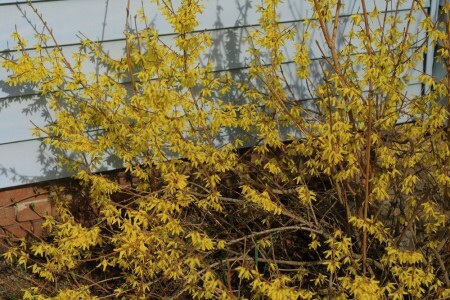 I’ve got pretty much the same thing but add flower buds on the apple trees, flowers on the witch hazel and the pieris in bloom. Hurrah for Spring! Snow. That’s what’s in my back yard, and more is predicted over the next couple of days. And I’m bitter and cranky about the whole deal, thank you very much. Your flowers give me hope that spring may eventually come to Wyoming. I’ve got an aphid dance party in the back yard. I’m afraid to look around too much out front, but I know the poppies are happy. My yard? I spy poison ivy. On the upside, I think there are two radishes almost ready for harvest. 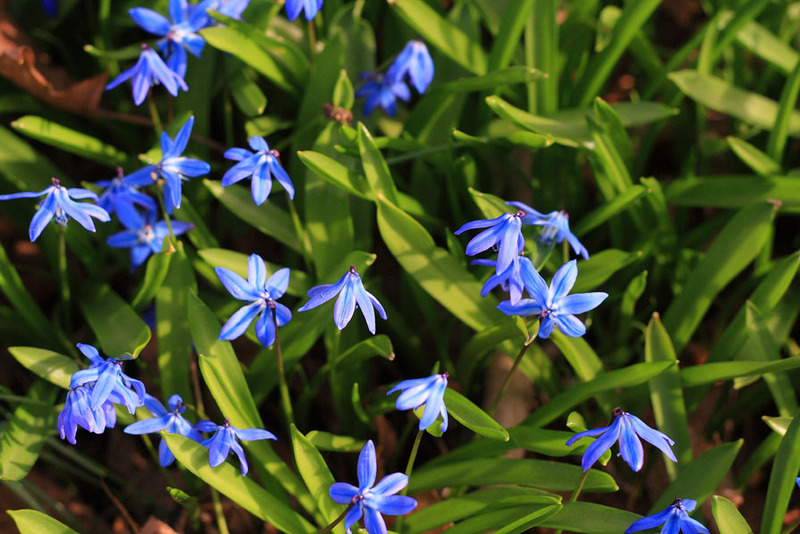 I love squill…but never knew that it had a name, or what it was. I really like the name, too…it’s fun to say. the pear tree is in bloom and the apple is starting to bloom. the lilacs are progressing from bud to bloom quite nicely (i have a half dozen varieties.) my lady banks and my wisteria are in full bloom. and so are the deep purple bearded iris. the trailing rosemary has a ton of blooms too. 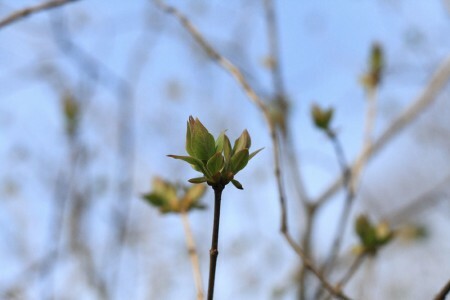 the rhodedendron is gettng ready to bloom and the camilia is about done. the coneflower is coming up, and so are the russian sage, the black-eyed susans and the day lilies. and the peonies. the olive trees are ready to go in the ground, as soon as the holes are dug. my yard is pretty big. I would love a backyard. But at $4,000/sq. yard for land in suburban Tokyo…I have a deck. My husband however, can do wonders with planters and tulips. Gorgeous. 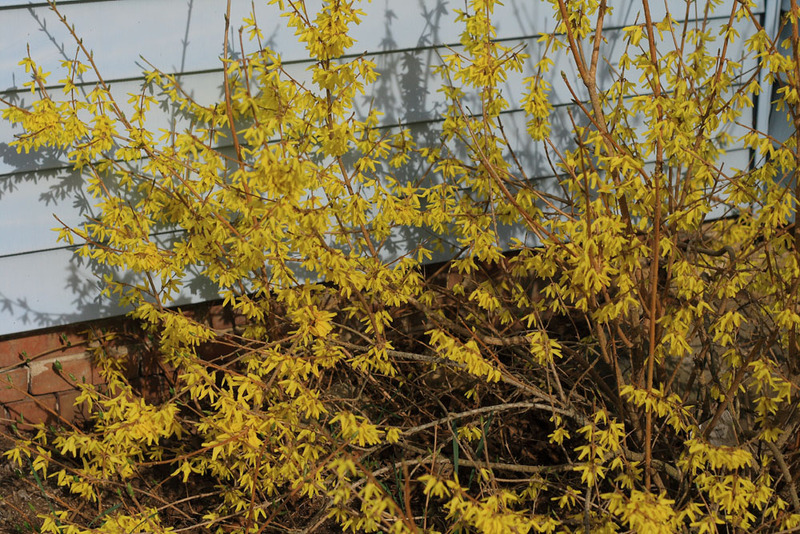 Outside my window is an enormous forsythia bush. Dang dog must have eaten my bulbs! Thanks for sharing your spring. I love it! My daffodils just are finishing up and the lilac is a wee bit ahead of yours… spring is so welcome. Lovely pictures. We’ve got a mess throughout our yard right now because they started working on our deck yesterday. Yay! Your spring is way ahead of mine! Beautiful pictures. A vegetable garden! Although it just looks like dirt so far. You know what’s going on in my yard. I’m getting used to it though. Squill~is that their name? I have always just referred to them as Those Little Blue Flowers in the Backyard! yipppeeee… Spring has arrived in New England!